Sample 3 of my favorite coloring papers: Colored Pencil, Marker & Mixed Media. Artist quality paper–stands up to burnishing, erasing and blending. *Important: please check your printer specs before buying this paper to make sure it supports the paper weight. 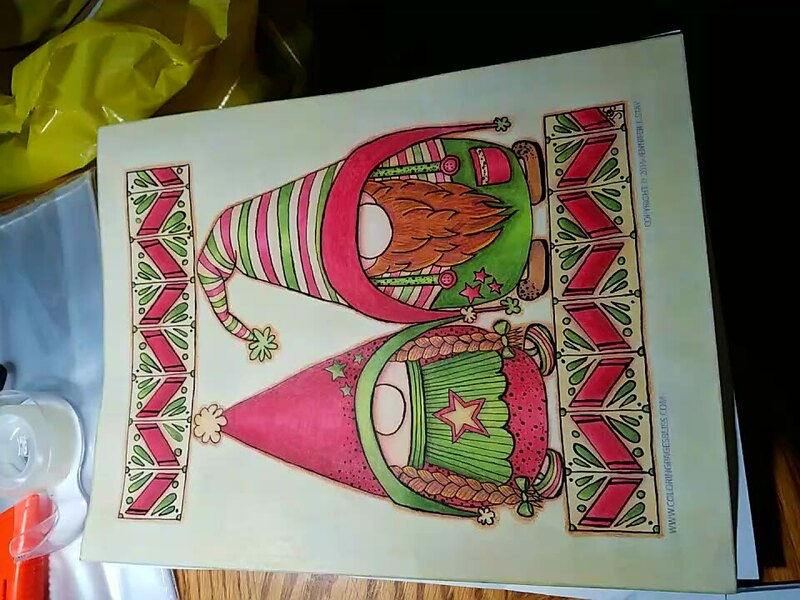 Want to see the difference high quality coloring paper can make? 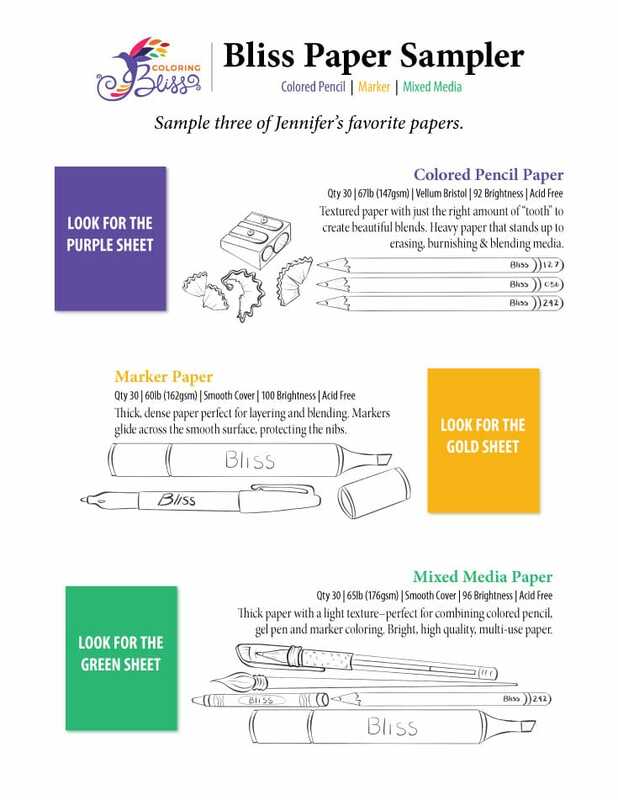 The “Bliss Paper Sampler” gives you 30 pages of each of my hand-picked favorite coloring papers (90 pages total.) This gives you a chance to give each paper a try. This sample packet is perfect! I can use my printer on two of them but the heavy card stock which I love, will not work, so I go up to my hyper local printer, take copies of the pictures I want along with my sample paper and they will do it for me! Saves so much space too. a huge difference. I am looking forward to working with all the papers. Update. Using the paper in the Sampler pack is amazing. It didn’t realize how much using the correct paper helps! The finished pages are better but best of all, the paper makes my coloring experience more enjoyable. Well worth the money. Great way to test papers! 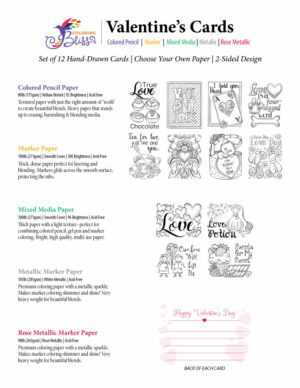 When I got the paper sampler I quickly ran off some coloring pages from this site. The first one I tried was the colored pencil paper and to really see what the hype was about I used plain old Crayolas. I have always colored but never like a colorist. The picture I made got me excited to try new techniques and new media. I like being able to try out the different papers before committing to a full ream. Picture looks amazing and when you factor in Crayola pencils? Wow just wow! No offense to Crayola, let me just add as a company and benefactor of children and schools…. KUDOS. I’m merely saying I’d love to see what you would do with this having used some Poly’s or even those new #Arteza’s they are awesome for their price range. Ok well just wanted to say great job!!! I’ll shut up now lol. I like the paper sampler. 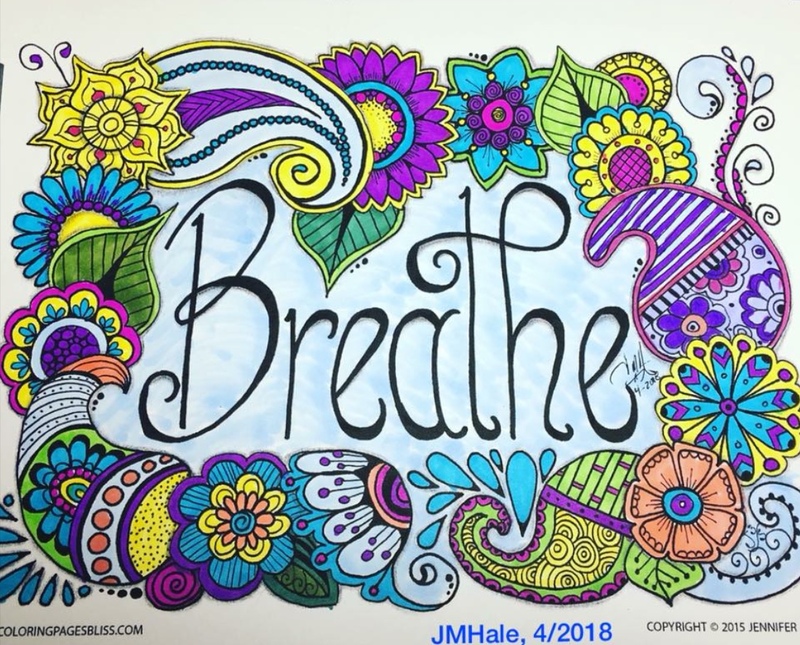 It’s great to try out all of the different methods of coloring using the correct paper. It makes a huge difference in the results. Worked well with my printer and coloring supplies. Helped me decided on paper and not waste money on paper that would not work. Thank you so much. Loved this sampler pack. I’ve been using the paper you previously recommended for colored pencils for months and love it. The paper you have for colored pencils in the sampler pack is thicker but it still fits in my printer just fine. I’m in love with the marker paper and how well my markers just glide over the paper. I’ve used almost all of it up already. I haven’t tried the multi media paper yet, but I’m looking forward to trying it with my water color pencils and pens as well as my gel pens. Thank you so much for offering this sampler pack. It’s so nice being able to try different papers out without having to spend time and money trying out all the different types of paper available. Swatch Bliss (Volume 3) – Swatching Fun!